Well after not hearing from the bride for a few weeks, up she pops with a solution. It seems she has 2 dresses for my approval and advice. She brings out the first one, borrowed from a recently married and divorced girlfriend. It is layers of chiffon, very pretty, close to the body with a rhinestone belt. It could be for a destination wedding or backyard venue. The second dress has a nice story. The bride was speaking to someone at work and the woman said she had bought a dress for her daughter,and she ended up eloping without using the dress. So now we have a pearl and sequin encrusted dress from David’s along with shoes, veil, jewelry and tiara…all for free. She tries on the dress and it needs taking in under the arms and shortening 6 inches in front from side seam to side seam. The only problem is the hem of the dress is a solid lace strip 10 inches deep with pearls and sequins. All this has to be removed by hand of course and it has been stitched on with invisible thread with very short stitches…..2 hours later having downed a diet Dr. Pepper and donned the good magnifying glasses… the strip is hanging off the dress and ready for replacement 5-6 inches higher. 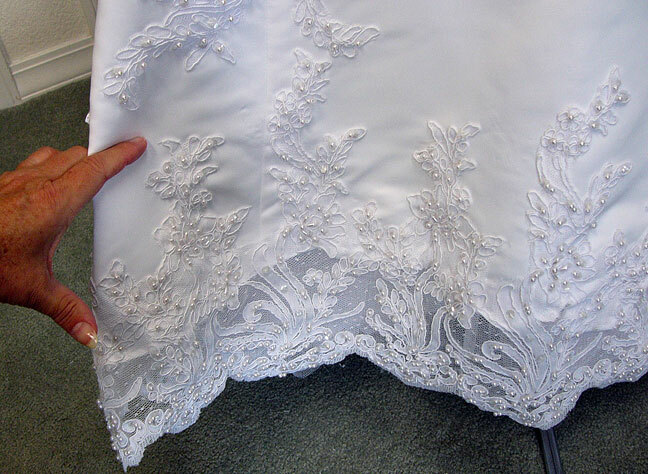 Luckily there is room above before we run into the other lace motifs in the middle section of the skirt. An hour goes by and then another with pinning and measuring flat on the ironing board before it is ready for the bride to try on with her free shoes. Fingers crossed it is close to what we need!